Dani was raised by her grandparents. Her grandfather was wise and taught her much. Shortly after Dani's powers manifested and her grandfather died, Dani moved to New York to join Xavier's Institute For Higher Learning and to become a member of Xavier's mutant team, New Mutants. 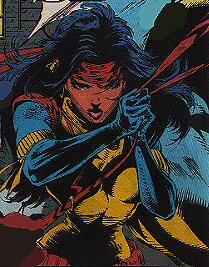 Dani was an original member of the New Mutants along with Cannonball, Sunspot, Wolfsbane, and Karma. At first, Dani could only use her powers one way: drawing images out of the mind of another person and use them either against the person or for the person. The images could be their darkest fear or their greatest passion (pretty cool). Later, Dani learned to control her powers and form them into psionic arrows that can be used to stun opponents (not as flashy but more combative). For awhile Dani became a valkerie of Asgard. Valkerie's can sense when people are going to die and if they should choose so, they can battle Death for the person's life. During an adventure to Asgard and Hel, Dani became closer friends with her fellow valkeries and she decided to stay on Asgard. Eventually Dani left Asgard and when she got back to Earth, she discovered the New Mutants were no more. They had become the mutant strike team, X-force. Dani was upset. This is when Dani began to work as an undercover S.H.I.E.L.D. agent, but we didn't find out that she was really doing that until later. She infiltrated the Mutant Liberation Front as part of her job and freaked out her old friends who thought she was really part of the team. She stayed with the MLF until just recently during Operation: Zero Tolerance. During Zero Tolerance the MLF battled Dani's old comrade's of X-Force. She tried to keep her MLF teamates from hurting the X-Forcers while trying to look like she was still loyal to the MLF. Eventually X-Force learned of the deception and Dani went with them when the whole crazy mess was over. Unfortunately, Forearm who had become Dani's friend was not very happy to learn she was a traitor(sort of). Dani traveled the country with X-Force, and she didn't really get along with Siryn at first or comit wholly to the team but she slowly became part of them again and even used her SHIELD pay to help the team get around until Sunspot got his funds back and set the team up in San Francisco. She isn't the only one to return to the team either. When Sam came back and X-Force was taken to Kentucky by Arcadia (later leading to his joining the team), Dani was touched by Arcadia and glowed strangely. This still hasn't been fully explained, but an ally of the team named Jenifer Kale told Dani that she seems to now be able to tap into some kind of cosmic force. Dani is an interesting character. It seems to me that she has always been somewhat arrogant, but perhaps she is just very self-assured. She has gone through a lot of changes over the years and I truly think it's for the better. She tries to act detached, but Dani cares deeply about everyone and everything. It would be nice to see that shown properly. At first I didn't really like her character, but slowly she sems to win you over. Something I'd really like to see is her in a romance with anyone, but with Bobby would be cool. She and Bobby have always been close and I don't really think he and Tabitha will work out.